Many people are sensitive, some extremely so, to gluten – a protein found in wheat, rye, and barley. As someone who had to give up wheat for 10 years, I can tell you that it isn’t easy, living without pizza, bread, and pasta. We still don’t eat much wheat around here. Many of the pasta recipes we make with rice pasta. The hard thing is finding good gluten-free baked goods. So many of them really taste awful, the consistency of sawdust. Fortunately, the wheat/gluten alternative flours appear to be improving. I found a bag of Wheat and Gluten Free Baking Flour from Red Mill in the health food section of our local grocery store and decided to try it out on a batch of pumpkin cupcakes. I had low expectations for this experiment, and thought it would help to dress up the recipe a bit with nuts and raisins, molasses and honey, anything actually, to help the cupcakes be more edible. The result surprised all of us; the cupcakes were delicious! Really good. Sort of like carrot cake, a good carrot cake. 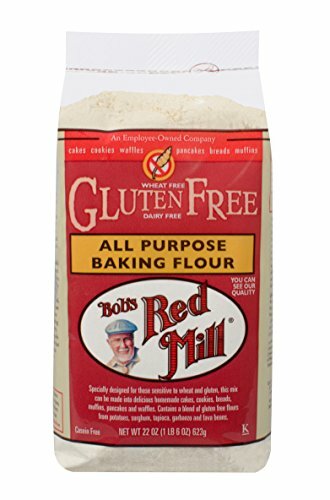 Note that Red Mill’s Gluten-Free Flour contains the following ingredients: garbanzo flour, potato starch, tapioca flour, sweet white sorghum flour, fava bean flour. *Note to make your own buttermilk, combine 1/2 cup of milk with 1/2 Tbsp of vinegar or lemon juice. Stir and let stand 10 minutes before using. 1 Preheat the oven to 350°F. Place an oven rack in the center of the oven. Add the eggs, one by one, mixing well after each addition. Add the vanilla extract and pumpkin purée. Beat until well mixed. 3 In a separate bowl, whisk together the dry ingredients — the gluten-free flour, baking soda, baking powder, salt and spices. 4 Combine dry ingredients, wet ingredients, and buttermilk to make the cupcake batter: Add the flour mixture and buttermilk alternately to the pumpkin batter, in three additions, beginning and ending with the flour mixture. 5 Add pecans and raisins: Use a wooden spoon to mix in the pecans and raisins. 6 Portion out batter into muffin cups: Arrange paper cupcake holders in a muffin tin. Portion out the batter into the cupcake paper cups, filling them close to the top of the cups. 7 Bake: Bake at 350°F for about 18 minutes, or until a tester inserted in the middle comes out clean. Remove from oven to a rack. Let cool completely before frosting. 8 Make the frosting: In an electric mixer, beat together the cream cheese and butter until smooth. Add maple syrup and confectioners' sugar and mix to combine. Once cupcakes have cooled, apply the frosting. Hello! All photos and content are copyright protected. Please do not use our photos without prior written permission. If you wish to republish this recipe, please rewrite the recipe in your own unique words and link back to Gluten-free Pumpkin Cupcakes on Simply Recipes. Thank you! I would love to make these for my sister, but she is also lactose intolerant. Is there anything that can replace the buttermilk? i really enjoyed these, but a friend of mine said they where a little dry. is there anything i can do to make them less dry? or ways to avoid this? Note: The raw cake batter will taste like beans, but don’t worry! You cannot detect the beans in the finished product. I also didn’t have molasses or maple syrup on hand, so I left them out and they were still wonderful. FYI- I tried this recipe using a loaf pan instead of making cupcakes. The outside got burnt while the inside was still sticky after 60 min. Maybe next time I’ll try lowering the oven temperature and see if that helps. On a positive note, while it’s presentation did not look good, it does taste wonderful! How would removing the nuts and raisens affect this recipe? Thanks for all of your tasty recipes- I have liked every single one I’ve tried! Regarding the flour in this recipe, would it be analagous to using cake flour, like in the red velvet cupcakes? I’m fortunate enough not to need the gluten free variety and was just wondering if the regular cake flour I have would suffice. Thanks! Thanks, Elise! I just wanted to let you know that I made these with 1 tsp xanthan gum and some other minor changes and they turned out great. Hi Elise! First of all, I’ve been a long-time fan of your blog, which, among others, motivated me to start my own. So I’m planning to make these cupcakes for a friend’s birthday this week and just bought the flour mix. I notice that the package recommends adding 1/2 tsp xanthan gum per cup of flour to cake recipes. Have you tried this recipe with xanthan gum. I bought it just in case. Thanks a lot! Is this recipe ok for someone with celiac? Hi, Thanks for your great recipes. I just wanted to make sure you knew that spelt contains gluten, so while it may be tolerated by some people with wheat sensitivities, it is not good for those with gluten sensitivities/allergies or celiac disease. This recipe is really good for these one-of-a-kind cupcakes. They were really good. Note from Elise: Sure, why not try it in a loaf pan? Thank you for share your recipe… My daughter 2nd birthsday is soon and I want to make cup cakes for her little friend and herself…. My question is…Can I substitute the pumpkin puree by something else???? I was thinking to make it with apples sauce or something else??? These cupcakes lasted maybe one hour after this picture was taken. Now all we have is this fond memory in the photo. Mmmmm. Hi Shauna – you are very welcome! Your dedication to your blog is a gift for all with celiac and gluten allergies. Thanks so much for mentioning my blog by name. I’m really honored. And I’m always thrilled when I see that people are making gluten-free baked goods. Especially when they look this yummy. I’m going to put this in my weekly round-up of the best gluten-free recipes of the week! Hi Stef – I had a medical issue that was affecting my intestinal tract. Once that was resolved, my wheat, alcohol, and other food sensitivities greatly diminished. Hi Sam – oops! Good catch. The ingredient was in my brain, but didn’t make it to the computer. Fixed now. I was reading the recipe for Gluten Free Cupcakes and would like to make them, however there is no amount for “pumpkin puree” It is not listed in the ingredients, only in the instructions. Please let me know how much is needed. oh, my hubby would love this! he’s got wheat sensitivities but can’t resist when i bake something for the kids. how did you overcome the wheat problems?